Aggravated Speeding | Cook County, Illinois Aggravated Speeding Lawyer The Davis Law Group, P.C. Contact Lake County, Illinois Speeding Ticket Lawyer The Davis Law Group, P.C. The defense attorneys at The Davis Law Group, P.C. represent clients facing misdemeanor speeding tickets throughout Illinois. 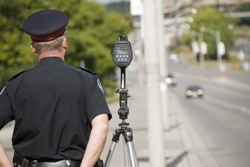 Speeding 26 mph or more over the posted speed limit is often referred to as Aggravated Speeding or Excessive Speeding. Our traffic attorneys have worked hundreds of cases under the new and old laws and have stayed up-to-date on all current developments. The penalties in Illinois for aggravated speeding were changed on January 1, 2011, July 1, 2013, January 1, 2014 and again on January 1, 2016 (See 625 ILCS 5/11 601.5). There have not been any significant updates to the law through mid-2018. Under Illinois law (625 ILCS 5/11 601.5(a)), speeding 26 mph or more in excess of the posted speed limit is no longer a petty offense, it is a misdemeanor criminal offense. Aggravated Speeding 26-34 mph over the posted speed limit is charged as a Class B Misdemeanor, punishable by up to six (6) months in jail and a $1,500 fine plus mandatory court costs. Under Illinois law (625 ILCS 5/11 601.5(b)), Aggravated Speeding 35 mph or more over the posted speed limit is a Class A Misdemeanor, punishable by up to twelve (12) months in jail and a $2,500 fine plus court costs. For either of these offenses, a defendant who pleads guilty or is found guilty by the court faces the possible entry of a misdemeanor conviction on their public record among other penalties imposed by the court. Under the most recent changes in the law (effective January 1, 2016), a driver may be eligible for Court Supervision if the driver has never been convicted or been given Court Supervision for aggravated speeding in the past. Court Supervision is a sentence that prevents a conviction from appearing on the driver's public record so long as the period of supervision is completed successfully (i.e. without any further traffic violations or offenses). Conditions such as community service, traffic safety school and fines may also be ordered as part of any sentence. The law prohibits court supervision for aggravated speeding in a highway-construction zone, school zone or in an urban district. As a result, if the defendant pleads guilty or is found guilty after trial, a conviction is the only available sentence. Therefore, an amendment to the charge or a verdict of not guilty after trial is necessary to keep a misdemeanor criminal offense from appearing on the defendant's public driving record. Our attorneys work to challenge or reduce the offense whenever possible. At The Davis Law Group, P.C., it is our highest priority to minimize potential consequences and ensure the best possible result for every client. Each case is unique and an experienced traffic attorney may be able to avoid a conviction and prevent serious consequences. Depending on various factors, including the driver's prior record, it may be possible to negotiate an amendment to a lesser offense. For example, it may be possible to have the charge reduced to a petty speeding offense (25 mph or less) or amended to an offense that allows for a sentence of Court Supervision. The likelihood of achieving a reduction depends on a broad range of factors. There are a number of steps we can take to secure the most favorable result for our clients. For example, when appropriate, our team will prepare and submit written mitigation to the prosecutor or request a conference with the judge. Of course, these cases may also be taken to trial when appropriate. The attorneys at The Davis Law Group, P.C. represent clients charged with misdemeanor speeding offenses throughout Illinois and the Chicagoland area including Cook County, Lake County, DuPage County and Will County. It is important that your defense attorney is familiar with the local courthouse where your case is pending. We have successfully handled hundreds of aggravated speeding tickets and are very well versed in the current state of the law and a variety of local courthouses. When charged with a criminal offense, it is important to seek the representation of a qualified defense attorney. If you are looking for knowledgeable and professional legal representation, feel free to explore our website and contact us to discuss your case. Call us today at (847) 390-8500 for a free initial consultation.